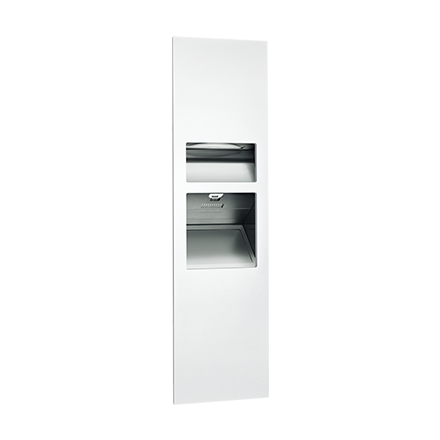 This sophisticated 3-in-1 cabinet is designed to be completely recessed into the plane of the washroom wall, highlighting the seamless design that defines Piatto™. The phenolic door is attached to the cabinet using field-adjustable, furniture quality hinges and is secured shut by an internal spring-loaded latch. All hardware is concealed giving the Piatto™ Collection its minimalist appeal. Holds and dispenses 500 standard multi-fold or 400 standard C-fold paper towels. Dispensing of multi-fold or C-fold paper towels does not require an additional adapter. Paper towels are manually withdrawn through dispensing slot and feed properly until depleted. Unit will continue to feed towels properly when correctly reloaded with a partial load in place. Refill dispenser by unlatching door and replacing towels for an empty or partially empty unit. The 3-in-1 also features a <15 second automatic hand dryer with a 5-year warranty. 208-240V. Optional voltages available. User activates dryer by placing hands in the sensor zone indicated by graphic on door. Drying time is automatically initiated as long as movement is sensed up to a maximum of two (2) minutes to prevent accidental hold-on. Dryer automatically shuts off after time-out when hands are removed from the sensor zone. Waste Receptacle has a waste capacity of 6.8 gal (26 L) and is equipped with a full cover and spring-hinge flap door to prevent unsightly overloads.